Creamy Pumpkin Dip made with cream cheese, pumpkin puree, and pumpkin pie spice. If you haven’t realized it by now, I’m pretty much a self-proclaimed pumpkin addict. 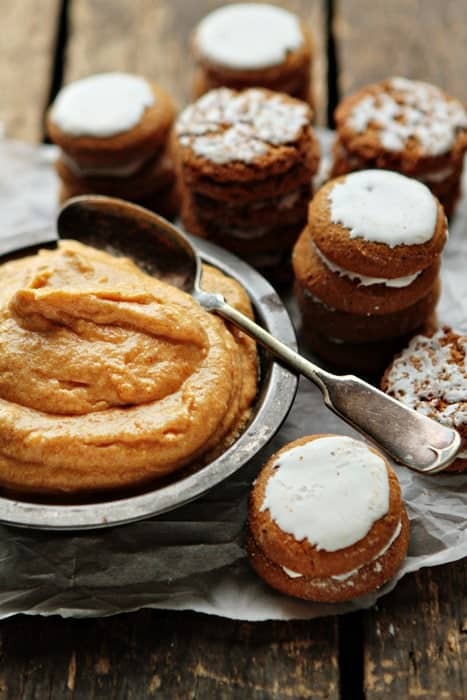 From Mini Pumpkin Pies and Pumpkin Roll to today’s recipe for Pumpkin Dip – I’m slightly obsessed. Judging by comments on the MBA Facebook page, people either love or hate this festive squash. 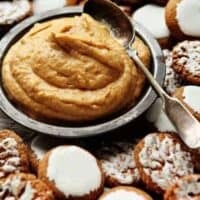 I had pumpkin dip years ago, but it fell off my pumpkin radar until a couple of weeks ago when someone tempted me with this delicious concoction again and the memories came flooding back. Although, I will confess, being 30 weeks pregnant, I’m pretty much tempted by anything and everything that happens to be edible these days. Pumpkin Dip comes together in a snap with minimal prep work. It’s perfect for a fall potluck, your Thanksgiving dessert table, or you can totally nosh on it for a midday snack – which is definitely my preferred method of consumption at the moment. 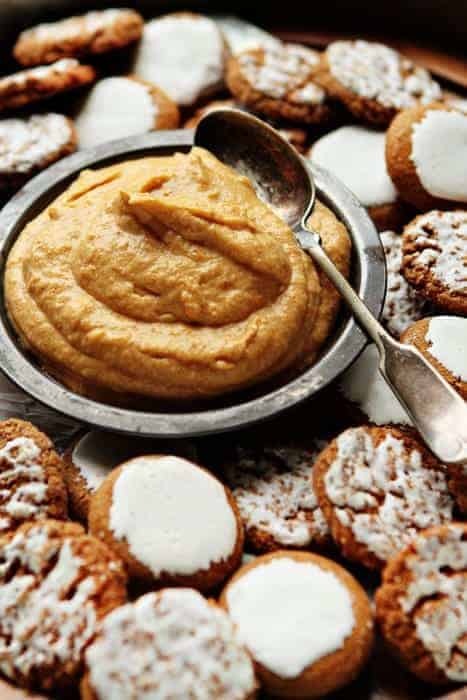 Pumpkin dip pairs perfectly graham crackers, molasses and gingersnap cookies and apple slices. You can totally be a rock star and make homemade cookies, but I chose to pull the pregnancy card and take a little help from the grocery store! Either way, your family and friends will keep coming back for more. Where do you fall on pumpkin? In the bowl of a stand mixer, fitted with the paddle attachment, or in a large bowl with an electric mixer, beat cream cheese on medium-high speed until smooth and creamy; about 3 minutes. Turn the mixer to low speed and gradually add confectioners' sugar. Once the confectioners' sugar is thoroughly combined, turn the mixer up to medium-high speed and continue mixing for another 2 minutes. Reduce mixer speed and add in canned pumpkin, vanilla, and pumpkin pie spice. Mix until thoroughly combined. Serve with graham crackers, assorted cookies and apple slices. Pumpkin dip will keep within the refrigerator for up to 3 days. If you care for a little more spice, simply increase the amount of pumpkin pie spice to suit your tastes. wow this sounds ridiculous (in a very good way). I wonder if you could spike it with some bourbon or spiced rum…for an adult party. This sounds really yummy! Is it very thick to dip into? I’m thinking of making pie crust twists to dip into this and am wondering if they would work or break. Mmm I’ve thought about making a dip with some leftover pumpkin puree I have, and this looks like a winning recipe for it! I made this according to the recipe, and it turned out too sweet for my taste. I think it would be better with a half to one cup of sugar. Thanks so much for the tip. Happy holidays and thank you for following MBA! anyone know how to get rid of the Morningstar Farms ad that is covering the recipe???? made this for a party and everyone loved it!! Can not thank you enough! I’m so glad that the recipe worked for you. Thanks for stopping by. I can’t wait to make this…my neighbors will LOVE it..and seriously GORGEOUS pictures! Thanks so much for stopping by, Shelly! I clicked on the Pumpkin Dip, but where’s the recipe? There was a slight glitch in the coding of the recipe. I’ve fixed it and it can be found here: https://www.mybakingaddiction.com/pumpkin-dip/ Thanks so much for bringing that to my attention. I used this recipe to make mini pumpkin pies with vanilla cookie crumble crust bottom, topped with whipped cream. It was terrific! I’m so glad you enjoyed it, Eugenie! Great idea!